As our imaginations grow, so too does the variety of hand-crafted items we design and create with wood, fiber, crystals, and feathers. 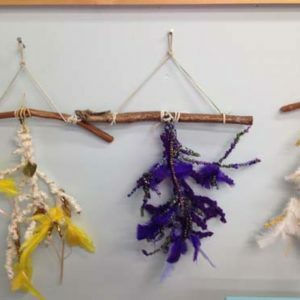 The dream catchers, also referred to as abstract wall art, combine spruce branches grown at Serendipity Meadows with various colors and textures of yarn, ribbon, charms, feathers, and beads. One of Debbie’s largest dream catchers was sent to Durango, Colorado as a wedding gift for the bride and groom. Beforehand, she learned about each of their personalities, favorite colors, and hobbies, and incorporated these artistically into the dreamcatcher. All of our handmade products can be personalized to suit the customer’s preferences!